The second jewel in the Triple Crown of thoroughbred horse racing is held at Pimlico Race Track in Baltimore on the third Saturday in May. 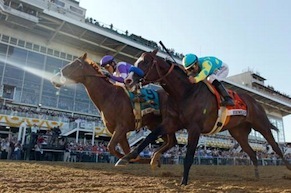 Horse Racing Television covers the events leading up to the race. This is quite the spectacular sporting event covered from every angle. A record crowd of 121,309 attended. Our coverage included building an anchor studio outside the barns where the horses stay when not running around the track. Cameras were also positioned on the club house roof and winner’s circle. For our production a total of six cameras were used, many with 1,000 foot triax cable runs. Additional crews gathered interview and b-roll material edited on site for our cablecast. Peter Roof’s role was as video technician shading and painting all camera pictures from a station in the truck’s engineering room.